I brought a visitor to market with me this weekend – my Mom! My parents were visiting and I showed my mom around downtown. She loved it! It makes me really happy to share the places I love with the people I love. The weather was a little dreary but we still had a great time walking around. 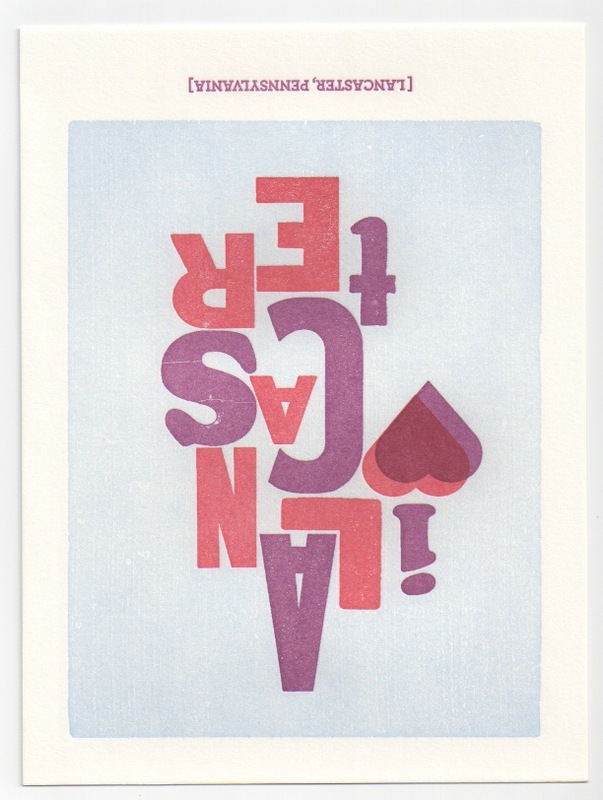 *letter pressed post card created by Moxie House and available at FIG Central. Last Saturday I went down to Central Market as usual. My intent was just to run down and get some veggies, make my way home and get some house work done. Instead I ended up spending all afternoon downtown enjoyably wasting the day. The day started off pretty gloomy and rainy. By the time I was ready to leave the house it started clearing up so I decided to take my chances and walk downtown. It turned out to be a beautiful day! The sun came out – it felt so good! We have been having so many rainy days lately it was nice to be outside as the summer days are turning into fall. I wandered in and out of a few shops along King and Queen Streets. I stopped in Fig central and Party Perfect, Zanzibar, Festoon and a few more places. I like to go in and out of the downtown shops from time to time just to see what’s new. I usually don’t end up buying much but it’s pretty fun to look at all of the odds and ends that are hidden inside. Market was hustling and bustling. All the vegetables are starting to change. The bounty of summer is becoming the harvest of fall. Which is ok with me, it just means warm comfort foods will start being made in my kitchen. For a few short market days, you can get the last of the summer veggies and the first of the fall veggies at the same time. I bought my last box of local multicolored cherry tomatoes last week, along with my last bunches of local basil with giant leaves. I didn’t find any of them at market this week. I am sad to say good-bye to some of my favorite ingredients but happy to start buying squashes again. There is a pepper boom right now. Everyone has homegrown peppers. One thing that I love about the homegrown peppers around here is that they are always a mixture of colors. 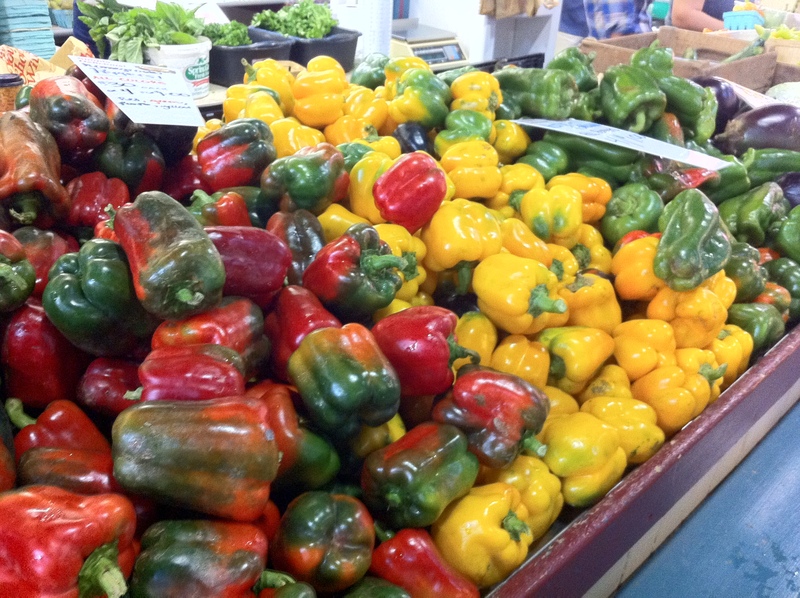 The yellow peppers are always yellow and green, the red and red and green, and the green are green and purple! Peppers are also really cheap right now (3 for $1!) so I bought a bunch and decided that I am going to make stuffed peppers this week. 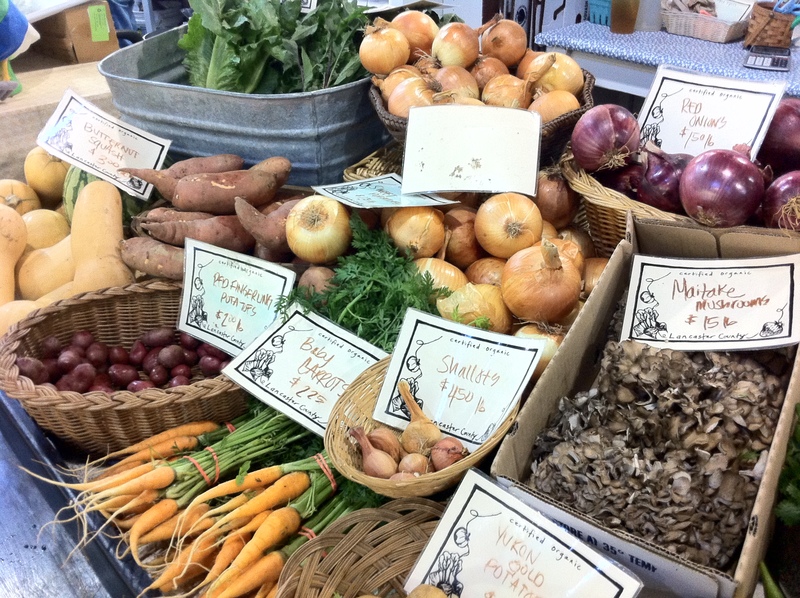 I made a very welcomed discovery while inside market… there is a stand that carries local garlic! I can’t believe I haven’t noticed it until now. I always wanted a steady source of local garlic at central market. Occasionally, the Lancaster Farm Fresh Cooperative carries local garlic, but it sells out quickly and it’s not there all the time. 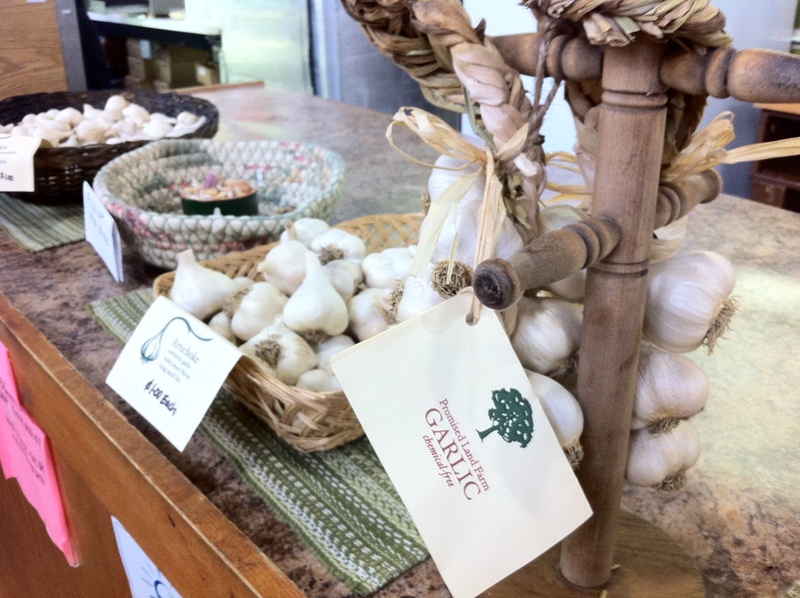 I was really happy to find that Rafiki’s Deli had a special table dedicated to garlic from Promised Land Farms. I chose to two varieties to try: Artichoke and Siberian. They are both really fragrant. I definitely notice a difference between the local garlic and the varieties imported from California and China. There is so much more flavor! One thing I can not understand is why we import garlic from so far away – It seems really silly when you think about how much it must cost to ship it that far. They already block off the entrance so cars can’t drive down here. And what a prefect place for tables! 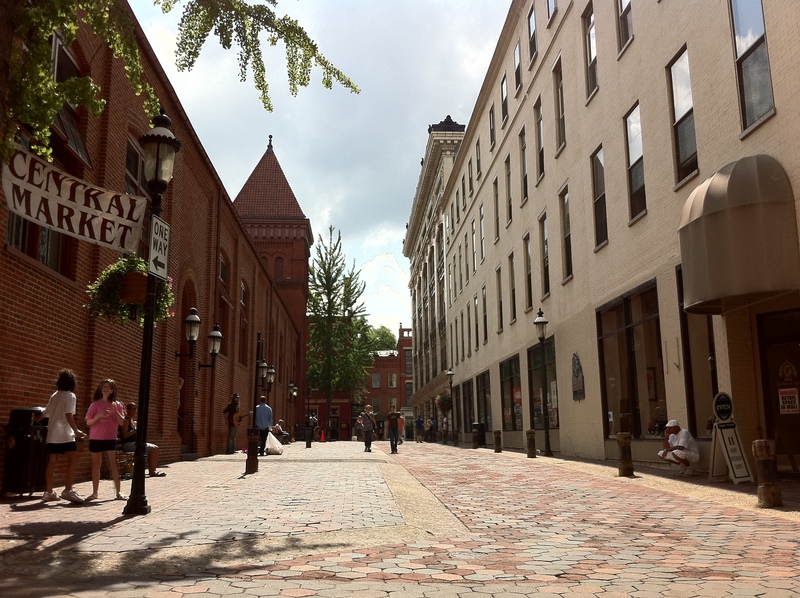 You would be able to get food inside of market and sit outside, enjoying your lunch in the fresh air. It would be awesome! A restaurant could even take over that area. I would love to have a good lunch with a lunch-time beer outside. We had lunch at Spring House Brewery’s TapRoom. Which is inside, but there are a lot of big windows so at least it was sunny and bright. 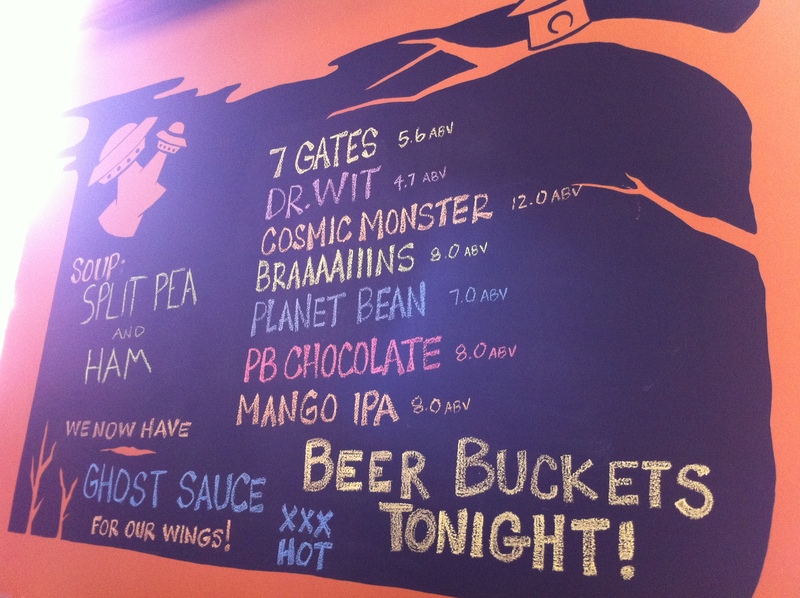 We tried the Mango IPA and Braaaiiins (pumpkin ale). The mango IPA was fruity but not too sweet. I thought it was going to be too flavored for me but it was delicious, a really nicely balanced fruit beer. I always like a good pumpkin ale, so I was hoping Braaaiiins was a good one. Spring House’s version of pumpkin beer tasted like pumpkin pie, nice and spicy with a hint of nutmeg. Not my favorite pumpkin beer (more on that one at a later date), but I have to say, Braaaiiins is pretty solid. It will probably be my beer of choice whenever I go into the TapRoom this month. This was my first time eating lunch at the TapRoom. I’ve had a few bar snacks there at night like the pulled pork quesadilla. I was never disappointed with the bar food so I assumed lunch would be pretty good. 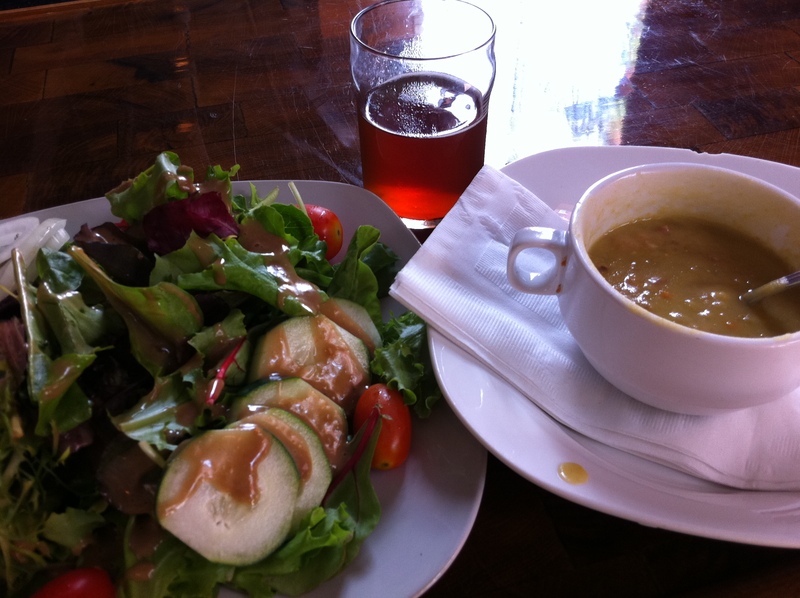 I had the split pea and ham soup and a garden salad. Both were good and the basil balsamic dressing on the salad was excellent.